It was a beautiful evening on Treasure Island this past Saturday night for Stefanie and John’s beach wedding at The Bilmar Beach Resort. 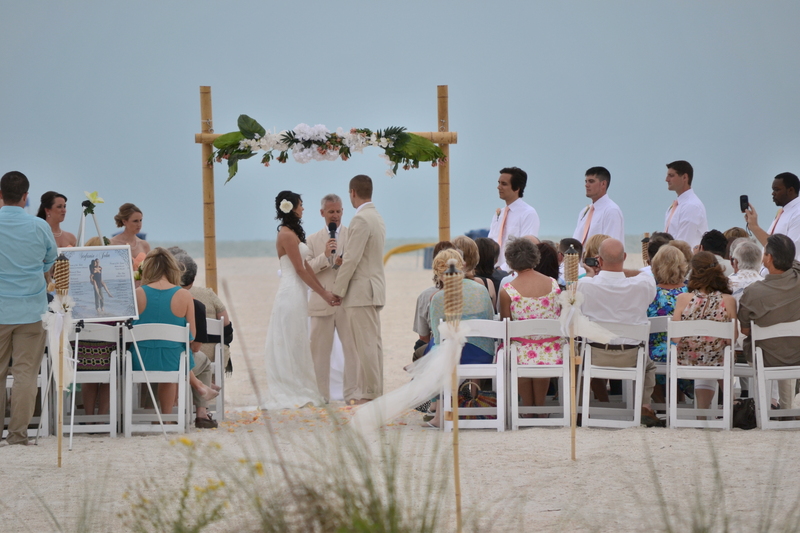 Stefanie, looking beautiful in her wedding gown, was escorted by her father across the sand to join John under their wedding arch with the Gulf of Mexico as their backdrop. 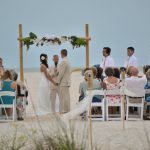 There, in front of their family, friends, hotel guests and beachgoers, the couple shared their vows, exchanged rings, and were pronounced husband and wife by Rev. Rick Lackore of Sensational Ceremonies, LLC . DJ Joe Lorenzo with Expert Productions took care of the sound and played the steel drum for the ceremony; Venue coordination was provided by Karen and her staff at The Bilmar and Event Director Sasha Abreu-Jimenez with Oh So Classy Events provided the coordination of everything for the happy couple and their guests. This photograph provided by Tammy Lackore. Congratulations to the new Mr. and Mrs. John Kelley!